When Arizona Coyotes’ defenseman Jakob Chychrun underwent surgery earlier in the offseason, there was concern that the 19-year-old blueliner could be at risk to miss the entire 2017-18 season. It’s never ideal for any player to miss any significant time, especially when that player is set to enter just his second season in the NHL after debuting at 18-years-old a year ago. Missing an entire season so early into a career could be devastating. Fortunately, Chychrun won’t miss the entire season, as Coyotes’ general manager John Chayka stated Tuesday. Chychrun was taken with the 16th overall selection in the 2016 NHL Entry Draft. Once believed to be the potential No. 2 pick in that draft following a 16-goal, 33-point campaign in 42 games with the Sarnia Sting in the OHL, the Boca Raton, Florida-native saw his production dip to 11 goals and 49 points in 62 games just one season later ahead of his first taste at NHL Draft eligibility. In the defense of Chychrun, however, he was coming off of major shoulder surgery and as such, the dip in production caused concern for just about every team that scouted him. Making his debut at just 18 years old, however, Chychrun made an impact right away with the Coyotes, scoring seven goals and 20 points in 68 games and looking like a legitimate NHL player from the get-go. The 2016-17 season saw many rookies experience a great deal of success, and Chychrun represents the next breed of young blueliners who are set to make their mark in a league that puts emphasis on solid, mobile defenders. At 6 foot 3 and 200 pounds, Chychrun can more than hold his own physically. Combining that with his skating ability, strong vision and high hockey-IQ and the Coyotes could be looking at a bonafide star who can take some of the pressure off of No. 1 defender Oliver Ekman-Larsson. Though Chychrun is now coming off of his second major injury before even turning 20 years old, the silver lining is the fact that the injuries were entirely unrelated. Had Chychrun re-injured his shoulder, there would have been some questions about the team’s decision to not only select him 16th overall, but the decision to move up in the draft for an injured player would have likely loomed over Chayka so early into his tenure as the team’s general manager. There are certainly examples of high-risk, high-reward picks in just about every draft, and Chychrun isn’t even the most recent blueliner who was once projected as the No. 2 draft pick to have slid into the middle-stages of the first round. 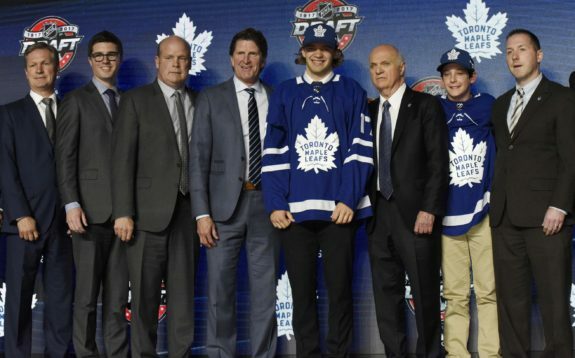 When Timothy Liljegren was drafted 17th overall by the Toronto Maple Leafs in 2017, one of the biggest narratives heading into the draft was answered. Once projected as a top-three pick in the draft who could have been picked behind only Nolan Patrick and eventually Nico Hischier, Liljegren missing time with mono and then playing in only 24 games between Rogle BK and Timra IK in 2016-17 cost him significant draft stock. The Maple Leafs are hoping that Liljegren can be the 2017 version of Chychrun, though it isn’t clear yet on where he’ll play in 2017-18, however, though the blueliner speculated that he could spend time both in Sweden and with the Toronto Marlies of the AHL.